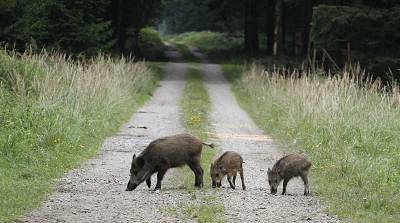 COPENHAGEN, Denmark — Denmark has begun erecting a 43-mile fence along the German border to keep out wild boars in an attempt to prevent the spread of African swine fever, which could jeopardize the country's valuable pork industry. It was authorized by Danish lawmakers in June after the government warned that Denmark's pork exports to non-European Union countries — worth $1.6 billion annually — could be affected by African swine fever. In 2016, total Danish pork exports were worth about $4.55 billion. German news agency dpa reported Monday that Jan Philipp Albrecht, the agriculture minister of the neighboring German state of Schleswig-Holstein, as saying the disease is "a serious threat for animals and the pig market." However, it said he added that "we have significant doubts about the usefulness and necessity of a fence between Denmark and Schleswig-Holstein."